A 10 minute walk over the fields to the north east from Geoghegan’s Bluff will bring you to Gurkha Mule Trench. 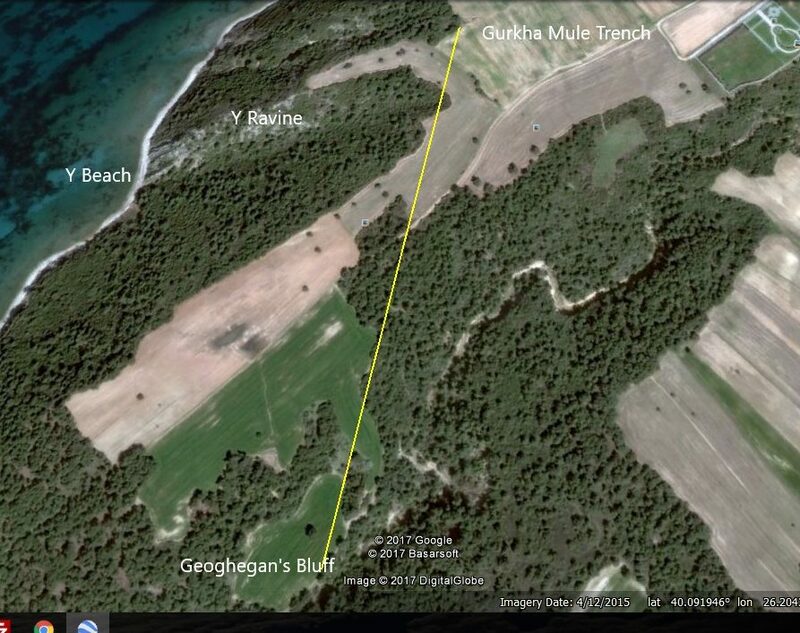 The Google Earth screen shot below should help. If you are using a compass then steer 10 degrees magnetic for some 600 metres, as per the yellow line on the map. Obviously you need to skirt round the deep scrub. For GPS use 40.094973°, 26.204671° as your target point for the deepest remains of the trench in the trees, that is, where the yellow line ends to the north east. In the Google Earth screen shot above, a narrow finger or ‘horsehead’ of grassed land can be seen running roughly westwards from the arrival point at Gurkha Mule trench. This leads on to Gurkha Bluff from where one can look down on Y Beach. Y Ravine is virtually impassable, but there is a route to Y Beach for the determined, see later. The still very impressive remains of Gurkha Mule Trench inside the treeline near Gurkha Bluff. In 1915 the trench depth would have been twice what it is now. The view above looks north westward towards Gurkha Bluff. The trench is very well preserved in the trees beyond, but out on the open field 100 years of ploughing and weathering has slowly filled it in. 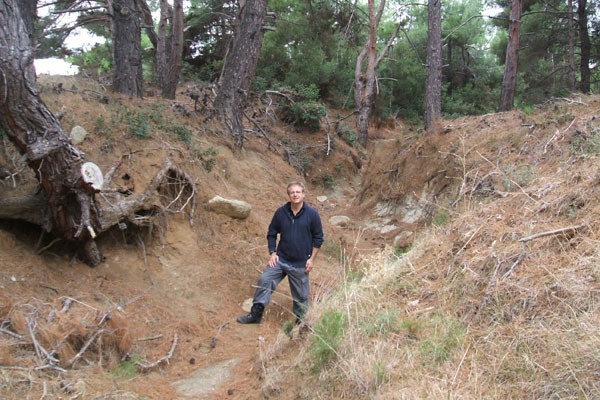 A few metres behind the position where this photo was taken all evidence of the trench disappears, until its entrance into Gully Ravine can be discovered a few hundred metres to the south west.